finishing their first 26.2-mile marathon or 13.1-mile half marathon. The secret to successful marathon training and half marathon training lies within staying supremely motivated, training smart & safe, and maintaining proper nutrition. The days of just “gutting it out” are long gone. Whether you are training for a marathon or half marathon, it takes a lot more than good old determination and willpower to get you through training and the big day. Let your mind lead the way, not your body. Don’t be set so much on willpower and determination that you miss out on the big picture of why you want to do this. By the way, why do you want to do this? Don’t let yourself off by stopping at your first answer! Dig deep! Why do you want to run a marathon or half marathon? When you go beyond that first answer, you will begin to realize what is really driving you. When you learn what is really driving you, then you can use that to push yourself through willpower and determination. You will build the foundation that will get your subconscious mind working for you, not against you. In short, you are in for an incredible experience. Whether you're already running more than twenty miles per week or if you haven't even seen a pair of running shoes in ten years, YOU can successfully train for and finish a marathon or half marathon. Believe in yourself. Once you learn the right way how to train for a marathon or half marathon, you will begin to believe, then you will realize your goal. How to train for a marathon? Well, the books, beginner marathon training schedules, half marathon training program, free newsletter, tips, and more on this site will be your guide to helping you learn how to train for a marathon or half marathon. If running a marathon is a long term goal, be sure to check out the 5K training and 10K training programs to get started running now. Bookmark the site and come back often for new tips and fun stuff to keep you running injury-free and full of motivation. Marathon calendar of marathon and half marathon events in the United States. Contact us with questions, comments, or suggestions. Marathon training tips for beginners, including a recommended 16 week marathon training schedule and program, nutrition requirements, and more. Marathon training books, half marathon training books, training journals, and visualization CDs!! The importance and role of nutrition during marathon training. You need to store lots of glycogen so enjoy those carbohydrates! What to eat and when. The importance of hydration while training for a marathon and steps to staying adequately hydrated while avoiding hyponatremia. The benefits of heart rate monitor training for runners and how to determine your maximal heart rate or heart rate training zone. Simple advice on marathon and half marathon motivation. Be open-minded and try new things to always keep yourself motivated. Great stories written and submitted by visitors to give you added marathon inspiration. Feel free to submit your own story to share with others or to help promote your charity. Various running articles on a number of marathon and half marathon related topics. Funny, motivational, and inspirational quotes about running. Be sure to use proper running form to conserve energy throughout training runs and on your big day. Common running injuries and injury prevention tips, including Shin splints, Iliotibial Band Syndrome, Patellofemoral Pain Syndrome, and Plantar Fasciitis. Sample of marathon cross training exercises that can help you through times of injury. List of marathon weight training exercises and the benefits of lifting weights during training. Get into the right running gear! Shoes, shoes, shoes...make sure to have the right pair for your feet. The longer you are on the course, the more likely you are to run into “the wall”. Knowing what “the wall” is will help you to avoid it or push through. 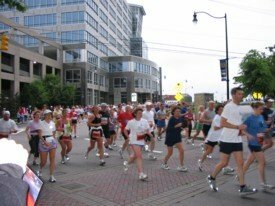 MarathonRookie.com’s Top 10 Rookie Mistakes made by first time marathon runners and how to avoid them. Marathon day tips for a fun and successful finish. Running safety tips to help you stay safe during training. Seven and ten week schedules for 10k training. Five week schedule for 5k training. Free weekly newsletter (ezine) loaded with running tips and more to help you achieve your running goals. Links to various health and fitness resources for marathon runners. Marathon Rookie: How to Train for a Marathon...and have fun doing it! Marathon Rookie eBook: The beginner's guide on how to train for a marathon (eBook and paperback book). Includes 16 week marathon training program and schedule. Half Marathon Rookie: How to Train for a Half Marathon...and have fun doing it! Half Marathon Rookie eBook: The beginner's guide on how to train for a half marathon (eBook and paperback book). Includes 10 week half marathon training schedule and program. Answers to frequently asked questions about marathon training and running. Just a couple of notes about a marathon training pace: run comfortably and remember your goal. Directory of marathons in the USA, Canada, Europe, and Australia. Half marathon directory included. Running news stories and current events provided by CoolRunning.com. List of popular running movies. Selection of running art to keep you motivated. Fundraising ideas and a list of organizations if you would like to run a marathon for charity. General tips for the beginning runner and getting started. General tips on marathon training for beginners. Marathons - How to select the right course for YOU. Half Marathons - How to select the right course for YOU. Schedule for mini marathon training (half marathon). Increase your glycogen storage by carb loading the week of the marathon. How to avoid overtraining for a race. Important tips on skin protection for runners and reducing the risk of skin cancer. Beginner mini-marathon or half marathon training schedules. Beginner marathon training programs: 16 & 26 week schedules. Regrouping from missed training runs to finish a marathon. Specialty running shoe store directory. Find your local running store and make a visit to get fitted by an expert. Get your family involved and the kids running too while you train for a marathon. View the latest site updates on the MarathonRookie.com blog.